This is Bob (Bob Dendy to be exact...sorta like dandy only with an "e," he told me). 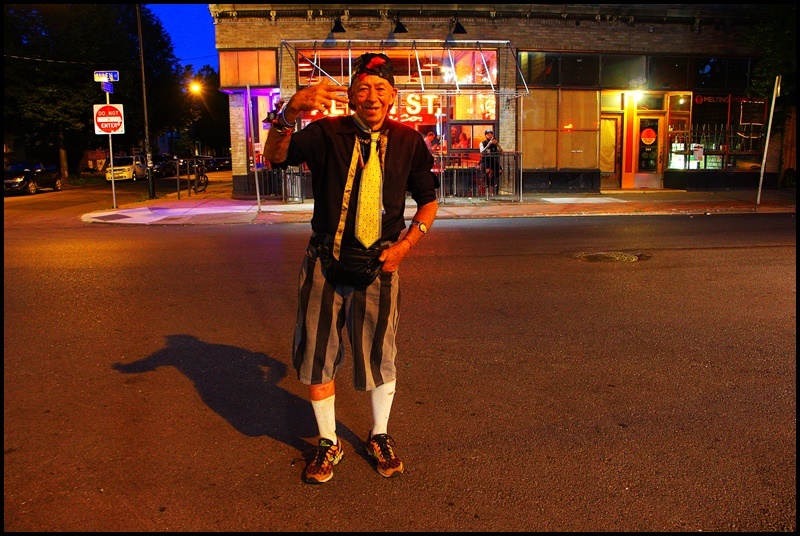 Just when I thought I've met every eccentric person in Allentown along comes Bob...wearing striped shorts, wide tie, suspenders, colorful sneakers, and socks pulled up tight. 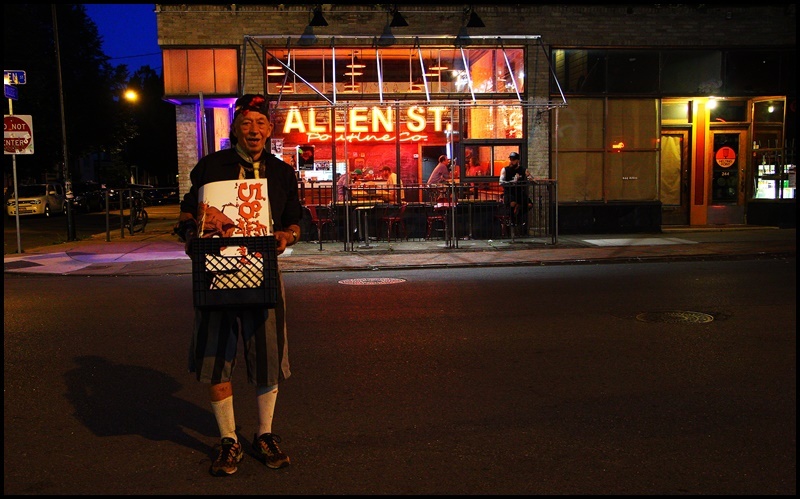 I was out doing one of my favorite pastimes (though I haven't in a while)...going out for a few beers and taking photos of my eclectic neighborhood. Anyhow, I had a beer and was waiting for the light to change as my favorite time to take photos is l'heure bleue, that magical time when the sun has set (or not yet risen entirely) but there is still light in the sky which gives it a lovely blue hue (hence it's designation). And there I was, a pint of beer in my belly and feeling somewhat stunned from lack of sleep, setting up my tripod, when I hear, "Hello...hi...what are you doing?" It was Bob. He was carrying a milk-crate full of stuff and told me he was an educator. When I asked who he educated he told me anyone who would listen. So I listened; I love to hear peoples stories. It turns out Bob is from Toronto; apparently grew up there and here. When I asked if I could take his photo he darted in front of the camera, "Well if you want to. Just tell me what to do." And when I asked him if he would hold his crate of stuff he grabbed it and said, "Oh, now you want to make it real." We talked for about 20 minutes, and I enjoyed it thoroughly. It turns out there are a lot of coincidences in our lives. When we parted and shook hands I could tell by the callouses on his hands that he has lived a life of hard work. He never did tell me what he taught, but I learned a few things from him. I learned (or at least remembered), that everyone has a story, and this is what I find fascinating. I declined his offer to stop by his place for a beer (turns out I know the person that owns the house he lives in), but nonetheless, people like Bob are what keep life interesting, at least for me.